Sheryland Neal wanted to be a Deusa do Ébano—an “Ebony Goddess,” in Portuguese. The first time I saw the Beleza Negra queen, I cried. She was strong, tall, elegant, gracious, and I saw myself in her. I cried because her beauty was the same type of beauty that I have. It was a relief to see her being celebrated. For many decades in the United States, I was not considered pretty. I was strange. They thought my skin was too dark. My arms and legs were very large. Every year, 16 Afro-Brazilian women compete to become the Queen of Ilê Aiyê, an Afro-Bloco carnival group in Salvador, Brazil, that promotes black pride and Afro-Brazilian culture in Brazil. Afro-Brazilians in the neighborhood of Liberdade started Ilê Aiyê in 1975 in resistance to Salvador’s carnival, which at the time excluded blacks. The group derives its heritage from Candomblé, an Afro-Brazilian religion traditionally led by women. Ilê Aiyê has traditionally been a carnival group for dark-skinned black people in Salvador, and the contestants of the Beleza Negra pageant represent this aesthetic. The goal of the Beleza Negra is to represent black women in a way that Brazilian and international media fail to—as strong, spirit-filled and divine. Ilê Aiyê’s theme this year was “100 Years of Madiba: Nelson Mandela”; contestants represented this in their dresses. The winner of the pageant will now reign as the Queen of Ilê Aiyê’s carnival, and her responsibilities include representing the Afro-Bloco in and outside Brazil, as well as dancing in carnival during the group’s parade. Neal traveled back to Salvador to prepare and compete, thanks to a fundraising campaign she started once she learned that Ilê Aiyê had accepted her application for the pageant. On the day she arrived, she went straight from the airport to her first practice with the other contestants, who ranged in age from 18 to their 40s. All but four came from Salvador. She made waves in Salvador and was featured on the front page of the local newspaper. The local population supported her participation in the pageant, which has traditionally been seen as a way to promote black women from local communities. Once settled in Salvador, Neal scrambled desperately to find someone who could create the two required dresses—one representing Ilê Aiyê and another representing a deity. She then learned a special dance that—more so than beauty—defines the Ebony Goddess. Neal found a savior in 27-year-old Cecília Cadile, an entrepreneur who placed third in last year’s Beleza Negra. Cadile’s involvement in the pageant dates back to when she was a teenager, when her sister competed in the pageant. In the two weeks before the pageant, Cadile worked as Neal’s coach, teaching her the special Ilê Aiyê dance and helping to prepare her two dresses. “She’s a already precious stone, and she only needed someone to help bring out the shine in her,” Cadile said. 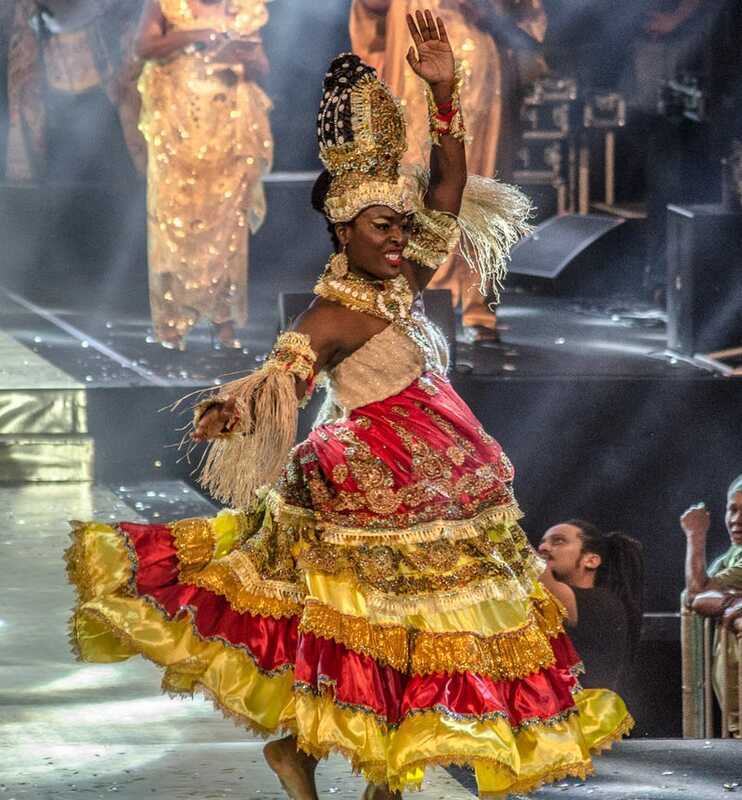 During the competition, contestants channeled the spirit of Candomblé goddesses like Oxum (Oshun) through a dance, while the Ilê Aiyê drum group played specific rhythms. Neal had already developed an intimate relationship with Afro-Brazilian culture and music through her participation in a Brazilian drumming group in the U.S., but she did not grow up with the rhythms and dances of Candomblé, a handicap she overcame within two weeks. Right before I was about to go on, we were standing in a narrow, one-window hallway backstage, and it was really uncomfortable. I was hot, I was breathless, I was dizzy, I needed to sit down, I needed to stand up. I needed to eat something, I needed to throw up ... all these contradictions! I perform and I’m fine. Neal didn’t win the contest. The new Deusa de Ebano is Jéssica Almeida Nascimento dos Santos, 19, who hails from the Cabula neighborhood in Salvador.